Every Dad makes better choices when he’s balanced. A Father can be a breadwinner, a janitor, a playmate, a judge, and a jungle gym, all within a single hour. Changing roles so frequently can be difficult, even frustating – especially if you have not been taking good care of yourself. You can Be The Better Dad more often, when you are taking care of yourself, and your partner, and your children, in a way that works best for everyone. Find those ways to live well, and live by them. This website is a collection of some of the ways that work for me and mine. You can take better care of your family when you take good care of yourself. Father of 3. Blogger. Parkour athlete. Digital media producer. Former superhero. Balance is not a noun. The act of balance is a continual struggle to symmetry, requiring constant correction. A father’s path is guided by his burdens. As you carry your Work and your Family, they weigh against each other. Every new influence in your environment can be instantly counterbalanced, with an extension of yourself in the right direction. Or, you can allow the unexpected to push you off your center. You can stay balanced by reaching elsewhere. There’s a trick about balance. When returning to equilibrium, there are two paths to get there. You can perfectly oppose the unbalancing force, with exactly opposite moves, to neutralize all the effects one side has on you. This doesn’t work very well, it takes tremendous precision, and at best, it removes the unbalancing force; it doesn’t actually return you to your center. he reaches up above himself. Reaching up through the crown of his head, the dancer negates any unbalancing forces in his limbs, by reaching for a center high above him. What Elevates a Father is Play. Play is your stabilizing force. When Work and Family are moving chaotically, it is through your Play that you can achieve balance. Your Play nourishes you, giving you better balance and strength. A time-honored cure of a terrible day at work is a visit to the bar. Having a stiff drink and a friendly ear to listen to you vent is a great way to leave the bad day behind you, and prepare for a relaxed evening with the family. If you return home after a terrible day of work, and you haven’t given yourself any Play, what happens? You are stressed and irritable, much more likely to snap at your kids instead of hugging them. Likewise, if your Family takes a lot of attention one evening, because of bodily fluids and dirty sheets, your Work could suffer the next day – unless you get in a burst of exercise before your day starts. Even after a sleepless night, some early morning cardio can keep you focused the next day. When you Work too hard, your Family life suffers. When you spend too much time with your Family, your Work suffers. When you spend too much time with your Play, everything else suffers (even if you are having a really good time). Being a good Dad requires you to constantly re-align to your point of balance. But here’s the thing about balance: you don’t stay there naturally. Distractions make you bend a little bit away from your center. Gusts of wind can knock you over. The footing can be treacherous, and the whole time, you’ve got the cries of kids in the background tearing away at your concentration. Many of the very qualities that make us good in business – being driven, dedicated, firm to our word, and unyielding after a decision has been made – can make us terrible fathers. Many of the things your partner wishes for in a father – being flexible, willing to wait and change deadlines, happy with a poor result – are the very things that can cost us a job. Being a father means you have to know when to lean, which side to lean to, and when you’ve gone too far. Too much Play can unbalance you, too. There are 3 aspects to your fatherhood: Work, Family, and Play. If you play all the time, your work will suffer, and your family will suffer. Your play needs to be directed, and intentional, so it can support the lifting of your burdens, and not cause you to drop them. your Play is what helps you to rise. Your Play is what elevates you. 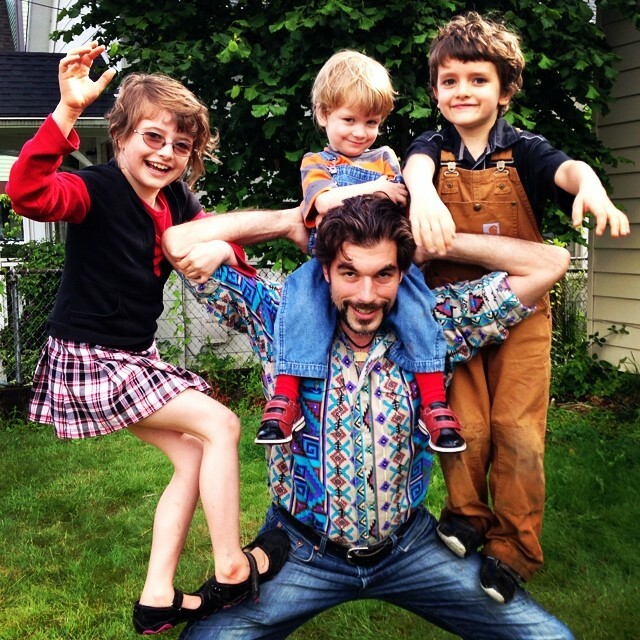 How do you elevate yourself, to improve this delicate balance that helps you to Be The Better Dad? 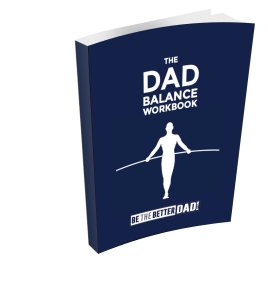 The Dad Balance Workbook is a good place to start. These ten worksheets are designed to help you identify easy steps you can take to return to balance, and to alert you when your balance is in danger of knocking you over.